Made a little money playing in the bars, with two beat up drums and two old guitars. From the Crescent City to the Great Salt Lake, it ain't what you got, it's what you make. Necessity is the mother of invention. Less is more. Make it work with what you've got. 2 Guitars, a junkyard drum kit (harvested from an actual garbage heap- adorned with tambourines, flowers and kitchen rags), a handful of harmonicas, voices, and above all.. songs. 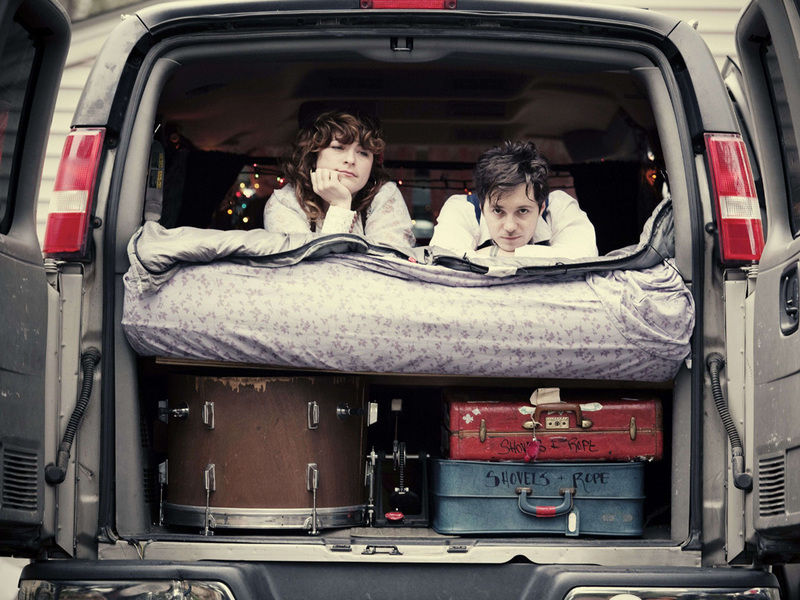 Hailing from Charleston, South Carolina, Shovels & Rope prefer to keep it simple. They have cleverly managed to take 3 separate recording projects and combine them into 1 cohesive, folk rock, sloppy tonk, harmonized, loose but tight, streamlined audience killing machine. Shovels & Rope spent 2011 on the road. More than 170 shows and over 60,000 miles of windshield time, they traveled along side Hayes Carll, Justin Townes Earle, Jason Isbell, the Felice Brothers and Butch Walker and found time to write and record a new record along the way. Recorded in their house, van, and backyard, O' Be Joyful is slated for release in Spring of 2012. At the shows, expect to hear a little something from any or all of their releases - while the duo switch instruments and share lead vocal duties. Also prepare to rethink your definition of a live rock band. Shovels & Rope is a duo from Charleston, South Carolina made up by Cary Ann Hearst and Michael Trent, but they give the impression that they could have come from anywhere in the good ol' U.S. of A with their loose and loud blend of American roots music traditions. Veering gleefully from stomping blues, to tender folk, to raucous country, mixing and matching at will, Shovels & Rope's one consistent quality is their unbridled passion. Take “Keeper” for example. Kicking off with simple, clomping drums and electric guitar dipped in crackling distortion. Hearst and Trent join their voices together, adding country twang to the blues rock stomp. The album's title track “O' Be Joyful” exercises their skill at grooving stomps. Combing hip shaking sprinkles of banjo, deep, guttural electric guitar and aggressive but restrained drums, the track is crackling with energy. The album's highest point is undoubtedly “Birmingham,” a stirring ballad telling the tale of musicians wandering the American landscape, not unlike Shovels & Rope themselves, who logged 60,000 miles on the road last year. The duo lay out a loose, swinging rhythm, adding on gratifyingly rusty sounding acoustic guitar and some of the best vocal hooks on the album as they tell their tale. The song's lyrics sum up Shovels & Rope as they sing, “Rock of Ages, cleave for me / Let me hide myself in Thee.” They combine the sounds of decades of musical traditions from folk to rock, and we'd happily hide ourselves away with O' Be Joyful and a pair of headphones.